Historically, the name Aldabra was Al-Hadra or Al-Khadra (with several variants), given by Arab seafarers for "the atoll’s harsh, sun-baked environment"; this name was included in the Portuguese maps of the 16th century. They had named the Indian Ocean as Bahr-el zanj. It was visited by Portuguese navigators in 1511. The islands were already known to the Persians and Arabs, from whom they got their name. In the middle of the 18th century, the atoll became a dependency of the French colony of Réunion, from where expeditions were made for the capture of the Aldabra giant tortoises. As there are no surface freshwater sources on Aldabra, the interests of the explorers (no proof of any explorer's visit prior to 1742) was only to exploit the species of tortoise, turtle and fish, and not to inhabit the atoll. In 1810, with Mauritius, Réunion, the Seychelles and other islands, Aldabra passed into the possession of Great Britain. Réunion was later returned to France, and Mauritius gained possession of Aldabra as well as the rest of the Seychelles. The previous inhabitants were emigrants from the Seychelles. Admiral W. J. L. Wharton of the British Navy landed in Aldabra in 1878 to conduct hydrographic surveys of the islands. In 1888, first settlement was established after the Concession was granted by the Seychelles authorities. The small settlement was established on Picard Island facing west near the beach. The intention was to exploit and export the natural resources of the islands. The villagers built a chapel, in the middle of the badamier trees, with timber and steel which was an essential addition to the plantation houses and office buildings. As Aldabra had no water resources, large rectangular-shaped water storage structures were built adjoining each of the houses. A two-roomed jail was also built in the village, a remnant of which is still seen at Aldabra. The exploitation of tortoises for commercial purposes at that time is borne out by the remnants of a crushing mill at Picard Island, which was used to crush bones of tortoises, which were also brought in from other islands in the atoll. Efforts made to grow plantation crops of coconuts, cotton, and sisal failed due to inadequate water sources on the atoll; relics of these plantations are still found on some of the islands. In the late 19th century Goats were introduced as a food source for the villagers (about 200) living there. Ship rats were introduced and recorded before 1870, and house geckos were noted from the 1970s. Sailors landed on the atoll in the 19th century and attempted to raid the island for tortoises as food; in 1842, two ships were reported to have taken 1200 of them. By 1900, the tortoises were nearly extinct, and a crew would often have to hunt for three days to find one. In the early 1800s, concessions given to individuals almost destroyed the forests and tortoise habitats in many islands in Seychelles; on Aldabra Atoll, in view of its remoteness and rugged topography, only small areas of forests were cleared for agricultural operations (mostly coconut plantations) but the tortoises were intensely captured for meat and trade. However, James Spurs, who had the concession of the atoll, was responsible initially for saving the tortoises on the atoll when he banned killing them in 1891. Following World War II, exploitation of Aldabra for commercial use came to an end and restrictions were even imposed on the number of people who could stay on the islands; this number was fixed at 200 at a time. Introduction of invasive species was banned, faunal species were protected under law, and active research on the ecology and biodiversity of the atoll was undertaken by the Royal Society of London from the middle of the 1970s. Aldabra, along with Desroches and Farquhar, was part of the British Indian Ocean Territory from 1965 until Seychelles' independence in 1976. In the 1960s, as a part of their 'Ocean Island Policy', and to support East of Suez commitments, the British government considered establishing a RAF base on the island and invited the United States to help fund the project in return for shared use of the facility and a settlement of 11 million dollars. Simultaneously (mid-1960s), the British Broadcasting Corporation became interested in Aldabra as a possible site to locate transmitters with which to rebroadcast the BBC Overseas Service (BBC) into the African mainland. The BBC mounted a fact-finding expedition (Expedition Turtle) to assess its suitability for this purpose. The BBC were dependent upon the RAF for developing the atoll as without this their own ambitions would not have been feasible. After an international protest by scientists (known as 'the Aldabra Affair'), however, the military plans were abandoned and the atoll instead received full protection. The "Environmental lobbyists" under the leadership of Julian Huxley, with the support of the MP Tam Dalyell, got the British venture torpedoed. In 1966, the Minister of Defence Dennis Healy of the British Government had observed that: "As I understand it, the island of Aldabra is inhabited - like Her Majesty's Opposition Front bench - by giant turtles, frigate birds and boobies." Subsequent to the thwarting of plans to establish a military station at Aldabra (which instead focused on Diego Garcia in the Chagos Islands), the Royal Society of London resumed their scientific study of the flora and fauna of the atoll with Professor David Stoddart as the leader. The Royal Society bought the lease of the atoll in 1970 and their research station became functional from 1970. After completion of their assigned work, the Royal Society left and the Seychelles Island Foundation (SIF), a public trust of Seychelles, took over the management and protection of the atoll in 1979. SIF functions under the patronage of the President of Seychelles and Aldabra was declared a Special Nature Reserve in 1981, and a year later it became a UNESCO World Heritage Site on 19 November 1982. A brass plaque inscribed with the citation "Aldabra, wonder of nature given to humanity by the people of the Republic of Seychelles" is stationed on the atoll. This appreciation befits the atoll which is truly one of the greatest ecologically undisturbed raised coral atolls in the world. Extremely isolated, Aldabra is almost untouched by humans. Aldabra atoll is closer to the coast of Africa 630 km (390 mi) than to Mahé, and is in the most southwesterly part of the Seychelles. It is 407 km (253 mi) northwest of Madagascar and 440 km (270 mi) from Moroni on the Comoro Islands. The atoll is the largest raised coral reef in the world with an elevation of 8 metres (26 ft); and the second-largest atoll in the world after Kiritimati Atoll. Located at 9°24′S 46°22′E﻿ / ﻿9.400°S 46.367°E﻿ / -9.400; 46.367 and belongs to the Aldabra Group, one of the island groups of the Outer Islands of the Seychelles, which includes the island of Assumption and the atolls of Astove and Cosmoledo. Aldabra atoll is 34 kilometres (21 mi) long (in east-west direction) and 13 kilometres (8.1 mi) wide. It has a large shallow lagoon,196 square kilometres (76 sq mi) in area, of which roughly two thirds is dry during low tide. The lagoon is encircled by fringing coral reef. Around the rim of the lagoon are the larger islands of the Atoll. The total land area of the Atoll is 155.4 square kilometres (60.0 sq mi). The size including the lagoon is 380 square kilometres (150 sq mi). The outside rim of the atoll has three passages which connect to the lagoon, which is 6–10 kilometres (3.7–6.2 mi) in width as it opens to the sea. The depth of water in the lagoon averages about 5 metres (16 ft); however, the passages that open to the sea are up to 20 metres (66 ft) deep and strongly affected by tidal currents. Aldabra atoll has, besides the four larger islands, some 40 smaller islands and rocks, all inside the lagoon, as well as a few very small islets at the West Channels between Grand Terre Island and Picard Islands, the largest of those being Îlot Magnan. Îlot Magnan 0.032 square kilometres (0.012 sq mi). 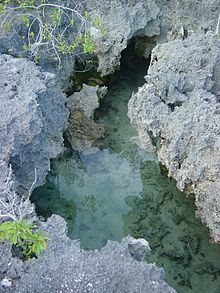 The atoll reflects both fossil and geomorphological features, the former is the source of the biodiversity seen today. The atoll is made of reef limestone of Pleistocene age (with irregular coral formations called "champignon", made up of two layers of varying stages of crystallization ) and this extends over an average width of 2 kilometres (1.2 mi) rising to a height of 8 metres (26 ft) above sea level, and forming the rim line (low cliffs with "deep notches, preceded by jagged pinnacles") of the shallow central lagoon. Geologically the limestone beds have been subjected to striation, sink holes and pits with prominent and continuous limestone bed on the eastern side above the sediment deposits. The coastline has undercut limestone cliffs above a perched beach; it is in two clear terraces of 8 metres (26 ft) and 6 metres (20 ft) height above sea level. Sand dunes dominate the windward south coast. While the terrestrial topography (spread over an elevation range of 0–8 metres (0–26 ft)) is rugged and dictated by the geomorphic conditions, the land surface comprises limestone of about 125,000 years age, which has uplifted many times above the sea level. The surface conditions are criss-crossed and riddled with pot holes and pits. In the eastern zone of the lagoon, though the surface is continuous, sediment beds are also seen. The windward southern coast is made up of sand dunes. Aldabra is situated in the dry zone of the south-west Indian Ocean. The northwest monsoon is from November to March and brings the heaviest rainfall. In the remaining months, the south-easterly trade winds are recorded. Aldabra receives an average of 960 millimetres (38 in) rainfall per year. Cyclones are rare in the Seychelles on account of its nearness to the Equator. Tides in the coastal zone rise to 3 metres (9.8 ft) height, causing channel currents, and a huge influx of water; the main channel drains 60% flow into the lagoon. The reported monthly mean maximum temperature recorded in December is 31 °C (88 °F). The mean minimum temperature recorded in August is 22 °C (72 °F). Left: coral "mushrooms". Right: nesting male great frigatebird. The earliest study of the flora and fauna, and also the geomorphological structure is dated to 1910. There are 307 species of animals and plants on Aldabra. Reptiles are the prominent terrestrial fauna. Sir David Attenborough called Aldabra "One of the wonders of the world", and it is also known as one of "crown jewels" of the Indian Ocean. The higher areas of Aldabra are covered in pemphis, a thick coastal shrub, while the lower areas, which are home to the giant tortoises, are a mixture of trees, shrubs, herbs and grasses. There have been recorded 273 species of flowering plants, shrubs, and ferns on the atoll. There are dense thickets of Pemphis acidula, and a mixture of grasses and herbs called "tortoise turf" in many areas. This flora includes 19 endemic species and 22 species that are only common to neighboring islands, and several of these species are on the IUCN Red List. The tropicbird orchid (Angraecum seychellarum) is the national flower of Seychelles and is found in the dry craggy limestone champignon of Aldabra. Other endemic plants such as Pandanus aldabrensis, the Aldabra lily (Lomatophyllum aldebrense) and a sub-species of tropicbird orchid, Angraecum eburneum. The lagoon is bordered by mangrove forests, and has large inland seagrass meadows as well as areas of coral reef and sand flats. The mangroves, which thrive in tidal mudflat areas and saline conditions, are seen on the shores of the lagoon and are integral to the coastal ecosystem. There are seven species of mangrove occurring on Aldabra, three of which are rarely occurring species. These include 'Mangliye blan' or white mangrove (Avicennia marina) which grows to 12 metres (39 ft), 'Mangliye lat' or black mangrove (Bruguiera gymnorhiza) which grows to 18 metres (59 ft) in a conical shape, 'Mangliye zonn' (Ceriops tagal) which grows to 7 metres (23 ft) with a buttressed trunk, and 'Mangliye rouz' or red mangrove (Rhizophora mucronata) which is the tallest species up to 20 metres (66 ft) in height. The atoll has distinctive fauna including the largest population of giant tortoises (Aldabrachelys gigantea) in the world (100,000 animals). Tortoise size varies substantially across the atoll, but adult tortoises typically have a carapace length of about 105 centimetres (41 in) and can weigh up to 350 kilograms (770 lb). They are herbivores and feed on a variety of plants, trees and even algae that grows in the freshwater pools. The tortoises mate between February and May, the females then lay their eggs from June to September in areas with suitable soil layers. They lay eggs (the size of golf balls ) in a clutch of three to five eggs every few years in high-density areas and 14-16 eggs in low-density areas. The females can lay several clutches in a year and the incubation period is 73–160 days. The small vulnerable juveniles have to survive the predation by coconut crabs, land crabs, rats and birds. In the past giant tortoises have been relocated to many other islands in Seychelles and also to Victoria Botanical Gardens in Mahé. 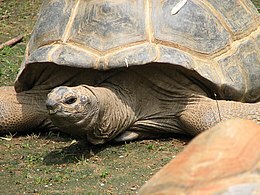 One of the longest-lived Aldabra giant tortoises was Adwaita, a male who died at the age of about 250 years at Kolkata's Alipore Zoological Gardens on March 24, 2006. Aldabra is a breeding ground for the hawksbill sea turtle (Eretmochelys imbricata) and green sea turtle (Chelonia mydas). 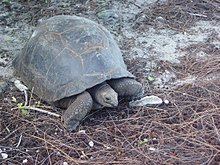 Aldabra has one of the largest populations of nesting green turtles in the Western Indian Ocean. Aldabra has a large population of the world's largest terrestrial arthropod, the coconut crab (Birgus latro); and hosts the white-throated rail, the only surviving flightless rail species in the Indian Ocean. Sharks, manta rays, barracuda can be found in the seas surrounding the island. During the Pleistocene the dominant land predator was the crocodilian Aldabrachampsus which is now extinct. Three extant species of lizards occur, the skink Cryptoblepharus boutonii and the geckos Phelsuma abbotti and Hemidactylus mercatorius. Pleistocene fossils also indicate the former presence of an Oplurus iguana and other skink and gecko species. There are three endemic species of bat from Aldabra: Paratriaenops pauliani, Chaerephon pusilla and the Aldabra flying fox (Pteropus aldabrensis), as well as the more widely distributed Mauritian tomb bat (Taphozous mauritianus). 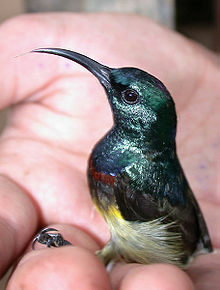 There are 1,000 species of insects, many of them endemic. Many species of butterflies also flutter around Aldabra. Endemic birds include the Aldabra drongo (Dicrurus aldabranus), the Aldabran subspecies of the white-throated rail (Dryolimnas cuvieri aldabranus), the last surviving flightless bird of the Indian Ocean region, and the endemic Aldabra fody (Foudia aldabrana), The islands are important breeding grounds for thousands of seabirds, including several species of tern, red-tailed tropicbirds, white-tailed tropicbirds, red-footed boobies, and the world's second largest breeding populations of great and lesser frigate birds. The bird fauna is most similar to Madagascar or Comoros and other birds found here include greater flamingos, the Madagascar pond heron, Comoros blue pigeon, Madagascar kestrel, Madagascar coucal, Madagascar nightjar, Madagascar bulbul and souimanga sunbird. At least 13 species of cetaceans, including dolphins, orcas, and especially humpback whales, have been known in the waters. Dugongs, once thought to be regionally extinct in the 18th century, have been confirmed for multiple times in very recent years. Conservationists feared a major threat to the atoll's biodiversity in the 1960s when, as part of the British Indian Ocean Territory, the British made plans to set up a military establishment on the atoll. Due to national and international opposition this plan was cancelled in 1967. This incident became known as the 'Aldabra Affair' in England. Invasive alien species such as rats, cats and goats that were introduced in the past threaten the native biodiversity of the atoll. Goats were eradicated from the atoll in 2012 after a long-term eradication program. Cats have been removed from all of the islands except Grande Terre Island, which allowed for the reintroduction of the Aldabra rail to Picard Island. Research into a feasibility study to eradicate rats from the atoll has been undertaken. Aldabra was until recently free of introduced birds but unfortunately the introduced Foudia madagascariensis that was introduced to Assumption Island, now occurs on Aldabra. An eradication program for this bird on both Assumption and Aldabra is almost done. Due to the limited space of its habitat, extreme weather conditions, epidemic and limited range could also pose serious threats to the entire ecology of the atoll. Aldabra atoll was designated a UNESCO World Heritage Site on 19 November 1982. it is one of the two UNESCO World Heritage Sites in the Seychelles ;, and is managed and protected by the Seychelles Islands Foundation (SIF). The marine protected area extends 1 kilometre (0.62 mi) into the sea to ensure preservation of its marine fauna. Eco tourism is controlled and introduction of invasive species is restricted. 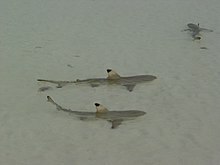 Based on the evaluation process, UNESCO inscribed the site, a legally protected special reserve of 35,000 hectares (86,000 acres), on the list of World Heritage Sites under three criteria: Criterion (vii): Aldabra Atoll encompasses a large expanse of relatively untouched natural beauty where a number of important animal species and some plant species thrive, along with remarkable land formations, and its process provides a unique spectacle of natural phenomena; Criterion (ix): The atoll is a superlative example of an oceanic island ecosystem in which evolutionary processes are active within a rich biota. The size and morphological diversity of the atoll has permitted the development of a variety of discrete insular communities with a high incidence of endemicity among the constituent species that are typical of island ecosystems. The natural processes take place with minimal human interference and can be clearly demonstrated in their full complexity; and Criterion (x): Aldabra provides a natural laboratory for the study of the process of evolutionary ecology and is a platform for key scientific discovery. The atoll constitutes a refuge harboring viable populations of a range of rare and endangered species of plants and animals. These include the last giant tortoise and flightless bird populations of the Western Indian Ocean, a substantial marine turtle breeding population, and large seabird colonies which number in the tens of thousands. The substantial tortoise population is self-sustaining and all the elements of its inter-relationship with the terrestrial environment are evident. BirdLife International declared Aldabra as an Important Endemic Bird Area (IBA) in 2001 on account of its large seabird colonies under categories A1, A2, A4i, A4ii and A4iii, covering an area of 33,180 hectares (82,000 acres) overlapping with the special reserve area of 35,000 hectares (86,000 acres) of Aldabra Atoll. Aldabra became a Ramsar Wetland Site of International Importance in 2010. Covering 25,100 ha (over half the area of the whole atoll) the wetland ecosystem of Aldabra include the extensive shallow lagoon inside the atoll, which is carpeted with lush seagrass beds and patchy coral reefs, the intertidal mud flats, the coral reefs outside the lagoon, freshwater pools, beaches, and 2000 ha of mangrove stands. These wetlands support several endangered species including the increasing number of turtles at the atoll, dugongs and many other bird, fish and invertebrate species. Aldabra was designated as a site under the Indian Ocean South East Asia (IOSEA) turtle network, in their 2014 convention. A small scientific research station of the SIF is based on La Gigi village on Picard Island. The permanent staff (currently 12) conduct research to study Aldabra's biodiversity. Aldabra is not easily accessed. No airstrips, helipads or landing jetties have been permitted to be built on the atoll. The nearest airfield on Assumption is 50 kilometres (31 mi) south-east of Picard Island. Supply ships operating from Mahé provide food and other essentials once every two months to the scientists and staff at the research station. Cruises are operated by several companies  along with dive boats which may visit the atoll on expedition tours. Visits to the island by people other than the scientists and staff of the SIF are strictly controlled and only guided tours are provided with prior permission. As of 2012[update], an average of 900 tourists visit the atoll a year. Within the atoll, paved walking paths exist from the village of La Gigi, which leads to a promontory from where scenic views of the large lagoon (during low tides) and the mangrove species are seen. ^ "Aldabra Atoll". Ramsar Sites Information Service. Retrieved 25 April 2018. ^ Dodd, Jan (2004). Mauritius, Réunion and Seychelles. Lonely Planet. pp. 268–. ISBN 978-1-74059-301-4. Retrieved 10 April 2013. ^ a b c d Anthony Cheke. "Timing of arrival of humans and their commercial animals on the western Indian Ocean oceanic islands" (PDF). Retrieved 27 March 2013. ^ "Aldabra Atoll: Aldabra Group". Official website of Tourism department of Seychelles. Retrieved 25 March 2016. ^ MairBeckley 2012, p. 11. ^ a b c d e f g h i j k l m n o p "Aldabra Atoll". Unesco. Retrieved 23 March 2013. ^ a b c d e MairBeckley 2012, p. 186. ^ a b MairBeckley 2012, p. 181. ^ a b c d MairBeckley 2012, p. 35. ^ MairBeckley 2012, p. 19. ^ Tam Dalyell (2011). The Importance of Being Awkward: The Autobiography of Tam Dalyell. Birlinn. pp. 124–131. ISBN 9780857900753. Retrieved 25 January 2015. ^ a b c d e "Ramsar". Official web site of Ramsar. Retrieved 19 February 2015. ^ SwinglandKlemens 1989, p. 106. ^ Coe 1998, p. 3. ^ a b c Coe 1998, p. 11. ^ a b Dev Raj Khanna; P. R. Yadav (1 January 2005). Biology Of Coelenterata. Discovery Publishing House. pp. 343–. ISBN 978-81-8356-021-4. Retrieved 27 March 2013. ^ a b c d e f "Aldabra atoll". Bird Life Organization. Retrieved 25 March 2013. ^ a b MairBeckley 2012, pp. 6–7. ^ MairBeckley 2012, pp. 181–. ^ Coe 1998, p. 29. ^ Coe 1998, p. 12. ^ "Aldabra". Official web site of Aldabra Foundation Organization. Retrieved 24 March 2016. ^ a b c "Aldabra Atoll, Seychelles". Ocean Portal by The Smithsonian Institution. Retrieved 25 March 2013. ^ MairBeckley 2012, p. 30. ^ MairBeckley 2012, p. 31. ^ MairBeckley 2012, p. 188. ^ MairBeckley 2012, p. 35, 189. ^ a b Brian Groombridge (1982). Iucn Amphibia-Reptilia Red Data Book. IUCN. pp. 79–. ISBN 978-2-88032-601-2. Retrieved 27 March 2013. ^ Matthew Murrie (21 September 2010). The First Book of Seconds: 220 of the Most Random, Remarkable, Respectable (and Regrettable) Runners-Up and Their Almost Claim to Fame. Adams Media. pp. 180–. ISBN 978-1-4405-1068-7. Retrieved 10 March 2013. ^ Arnold, E.N. (1976). "Fossil reptiles from Aldabra Atoll, Indian Ocean". Bull. Br. Mus. (Nat. Hist.) Zool. 29 (2): 83–116. ^ Goodman, S. M.; Ranivo, J. (2008). "A new species of Triaenops (Mammalia, Chiroptera, Hipposideridae) from Aldabra Atoll, Picard Island (Seychelles)". Zoosystema. 30 (3): 681–693. Retrieved 2014-09-13. ^ Hutson, A.M. (2004). "The bats of Aldabra atoll, Seychelles". Phelsuma. 12: 126–132. ^ MairBeckley 2012, p. 33. ^ MairBeckley 2012, p. 28. ^ MairBeckley 2012, p. 39. ^ Amla, Hajira (March 2, 2015). "A creature of mystery – rare dugong is sighted in Seychelles at Aldabra". Seychelles News Agency. Retrieved 2017-09-04. ^ MairBeckley 2012, p. 27, 48. ^ "List of World Heritage Sites". Unesco. Retrieved 23 March 2013. ^ "Aldabra Island xeric scrub". World Wildlife.org. Retrieved 25 April 2013. ^ a b c MairBeckley 2012, p. 187. ^ "Lonely Planet review for Aldabra Atoll". Lonelyplanet.com. Retrieved 25 March 2013. Coe, Malcolm James (1998). A Fragile Eden: Portraits of the Endemic Flowering Plants of the Granitic Seychelles. Princeton University Press. pp. 11–. ISBN 978-0-691-04817-8. Retrieved 23 March 2013. Mair, Lyn; Beckley, Lynnath (2012). Seychelles. Bradt Travel Guides. pp. 126–. ISBN 978-1-84162-406-8. Retrieved 23 March 2013. Swingland, Ian Richard; Klemens, Michael W. (1989). The Conservation Biology of Tortoises. IUCN. pp. 105–. ISBN 978-2-88032-986-0. Retrieved 27 March 2013. Wikimedia Commons has media related to Aldabra Atoll. For official site names, see each article or the List of World Heritage Sites in Seychelles. This page was last edited on 28 March 2019, at 04:46 (UTC).